In a world of marketing and media manipulation, our business is, and has always been, just about the gems. For more than 30 years we have sought out the finest colored gemstones from around the world and offered them to our clients at a fair price, backed by our personal guarantee. After all these years we can say, modesty aside, that we've had some success. But our success is not just a product of our integrity or the fact that we are nice to deal with. Those things are important, of course. But we know -- and our customers know -- that what counts ultimately is the product we deliver. It really is all about the gems. As gem dealers, we add value in 3 ways. First, in the gems we acquire. Second, in the decisions we make about cutting and gem quality. And third, in the experienced eye we provide to our clients. Sourcing fine gems is a continual challenge and is becoming more difficult all the time. Though only a tiny percentage of mining product is gem quality material, we buy only the best of the output. Indeed, we look at gems literally every day but we buy only about 1% of the gems we see. At one time most rough material was brought to Thailand for cutting, but now many gems are cut in the mining countries due to government restrictions on the export of rough material. This requires gem dealers to journey to the source and develop contacts in the mining countries. Dealers who wait for gems to come to them get only the leftovers -- indifferent color and mediocre clarity. Because gems cut in the mining countries are cut to preserve as much of the rough material as possible, we often have to re-cut stones to meet our quality standards. If we acquire some high quality material which displays a window we will always recut it before offering it for sale. It means that the per carat cost will be higher, since some weight is necessarily lost in the cutting process. But well-cut gems show full fire and brilliance, and the higher cost is well worth it. 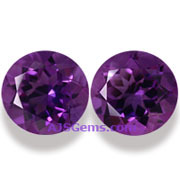 We know that buying fine gems on the internet can be a daunting prospect. It is why we take such care to make sure that our gem photos and videos are accurate. But not every customer has the experience to make a decision without expert advice. That is why we are always here to examine and compare gems for our clients and make recommendations. When you buy a fine stone from AJS, you buy our eye as well as our gem. Of course quality has its price. 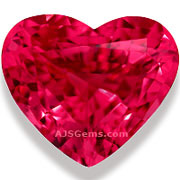 Fine gems do not come cheap, especially the top grades of sapphire and ruby. But when you consider the cost of setting gems in jewelry, it makes no sense at all to spend good money setting bad gems. A fine gem is a treasure that your family will keep for generations. This month we expand our notable gems section to display a range of fine matched pairs from our collection. Perfect gifts for gem lovers! A lovely pair of sky blue aquamarine pears in a large size. Beautifully matched with excellent color saturation, these are exceptionally clean and well cut. Completely untreated, these will make impressive earrings or a pendant. 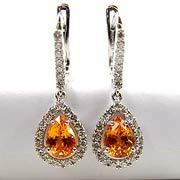 A fine pair of golden-orange imperial topaz from Ouro Preto, Brazil. 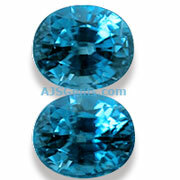 These well-matched cushion cuts are perfectly sized for earrings at about 7 x 5.5 mm. A perfect pair of deep purple amethyst from Zambia. Impressive 15 mm size and exceptionally clean (graded "loupe clean"). Two brilliant Nigerian spessartites with a total carat weight of 2.79 cts, set in 18k white gold. Set off by 48 white diamonds with a total carat weight of 0.80 cts. 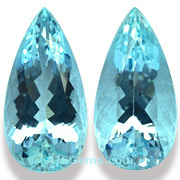 A beautifully matched pair of blue zircons of excellent color saturation and clarity (graded "almost loupe clean"). A lovely 4 piece set of matching Ethipian opals -- pendant, ring and earrings. Displaying impressive play of color with full color range. 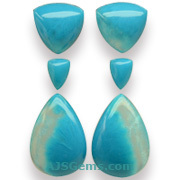 The large pendant stone is about 15.71 cts, with the ring stone 5.72 cts and the 2 earring stones total 11.54 cts. Classic and timeless, blue sapphire studs are always in fashion. 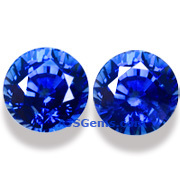 These bright royal blue Ceylon sapphires are sure to please and be worn for years to come. This gorgeous earring set consists of 2 pairs of stones, with carat weights as follows -- the 2 Mahenge spinels have a combined weight of 4.44 carats. 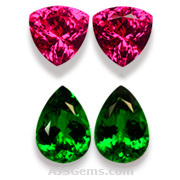 and the Tsavorite Garnets have a combined weight of 5.08 cts. We are offering this set as a complete suite, but will consider selling individual pairs for interested buyers. 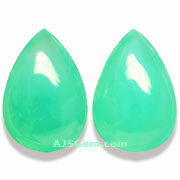 Not all fine gems are expensive ... such as these large chrysoprase pears from Australia. Well matched in color and size (21 x 14 mm), these display good translucency and a bright apple-green color. A unique and carefully matched set of earrings from the Ray Mine, Arizona. These very good pieces combine the vivid blues characteristic of the Ray Mine with some translucency. An elegant pair of Burmese jadeite earrings, set in 950 platinum with 78 diamonds. Featuring 8 pieces of fine jadeite with a total carat weight of 6.92 carats. All of the individual jadeite stones have been certified as A-Jade (natural and untreated jadeite) by the Gem and Jewelry Institute of Thailand (GIT). Two extraordinary colored diamonds set new auction records in November. Christie's Geneva sold a 14.82 ct. fancy vivid orange for a record $35.5 million, setting a new record of $2.4 million per carat. Not to be outdone, the next day Sotheby's Geneva sold the Pink Star, a 59.60 ct pink diamond, for more than $83 million, the highest price ever paid for a gemstone at auction. At Christie's Hong Kong, a 13.21 ct Burma ruby ring sold for just under $6 million, while an 87 cts t.w. Burma ruby and diamond necklace sold for $6.4 million. With the exception of our matched pairs, almost all of the gems we sell are unique, one-of-a-kind stones and you can only order quantity 1. But we do have some gems in calibrated sizes that we have sold in lots. Now you can order these gems in exact quantities of your choice, by specifying your desired quantity on the shopping cart page before you checkout. 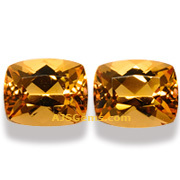 You will find this option available for our diamond melee, as well as for black star sapphires in sizes ranging from 9 x 7 mm to 10 x 8, 11 x 9, 12 x 10 and 13 x 11 mm. As you browse our site you'll find these item listed with the note "Available in quantity." The detail pages for the items will show you exactly how many are available for purchase. Actually the term "type A jade" or "A-jade" is used to refer to treatment, not quality. The term is used to refer to jadeite which is completely natural and has not been enhanced by bleaching, dying or impregnation with polymers. These are common treatments and only a gemological lab specializing in jade can certify a piece of jadeite as "type A." For more information see our article on Type A Jade from Burma. For those not familiar with Bitcoin, it is a new type of virtual currency that promises to lower the cost and improve the convenience of online transactions. It uses a peer-to-peer network architecture with a shared public ledger to verify transactions, instead of relying on a third party like a bank or payment processor. Bitcoin is still experimental and the price of bitcoins is quite volatile. Bitcoin will become less experimental as usage grows, and we have already acquired software to implement Bitcoin payments on our website when the time is right. To learn more about Bitcoin, visit the Bitcoin community website at bitcoin.org.